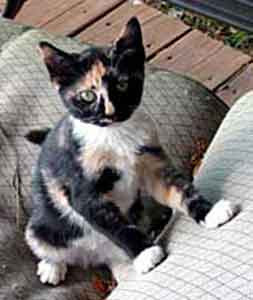 Talking Dogs at For Love of a Dog: Our New Kitten has Cooties! Okay, I admit I'm not sure what Cooties are, but I'm pretty sure our new kitten has them. How do I know this? Our cat, Skeeter, doesn't want anything to do with her. If she tries to nap on a chair with Skeeter, Skeeter might allow her to stay there... but she sure doesn't like the kitten to touch her! Actually, I don't like the kitten to touch me either. However, sometimes I do watch her to see what she's up to... out of just the corner of my eye, of course. She's pretty crazy, chasing leaves, playing with her own feet. Now what is up with that? I mean, I like my feet but I'd rather play with toys! Mama finally managed to get some photos of the new kitten and there's one showing above. Mama got pretty frustrated because it's hard to catch Isabel holding still for a picture. Oh, that's the new kitten's name: Isabel. Izzy for short. Jeffie adores Isabel and I'll post a picture of the two of them in the next day or two. I get the fascination, kind of, but he actually touches her! Yikes!